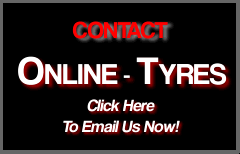 Online-Tyres.com has both In-Store and Mobile Fitting and Balancing Facilities. Our In-Store Fitting Facilities are available without the need to Book In, and are available for just $15 per tyre for most Cars, Utes, Vans and Four Wheel Drives at our Geebung and Townsville Locations. Online-Tyres.com's Mobile Fitting Vans can come to you and Fit/Balance your tyres at your home or office without the need to drive anywhere, this service is available in the greater Brisbane Region with an average cost of $25 per tyre. Our tyres are imported directly from manufacturers, most of which work under contract from the Big Name Brands. Refresh this page a few times and see if you can recognise the tread patterns in the Sample Section. - Click the Link on the left to send us an Email. - The Online-Tyres.com Team try to respond to all Emails within 48 hours.